The Israeli choreographer Hofesh Shechter, who recently received a variety of talent and newcomer awards, continues his string of successes with his work “Political Mother”, which premiered in 2010. The piece follows on from the works “Uprising” and “In your rooms”. 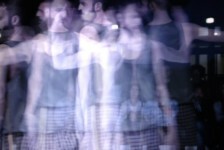 In 2008, critics described Hofesh Shecter as someone to watch, celebrating the work of the drummer and dancer who is in residence at the Brighton Dome as a new form of contemporary dance. “Political Mother” is louder, faster and more furious than his previous works, and music once again functions as the guiding theme of the performance. A band of drummers and guitarists, a group of dancers and a lightshow reminiscent of a rock concert fire up the audience, confronting them with controversial political references. Despite the occasional effrontery this may cause, the music and dance remains at the forefront of the performance. Hofesh Shechter says that music brought him to dance, and he demonstrates the interconnectedness of the two forms the way he experiences it. The vibration of the air is converted into impulses of movement in the body, and these develop into dance. The audience experiences this transfer of motion as it is enveloped by the rock rhythms, captured by the light, extremely refined and rapid dance movements and carried by the dark, the volume and the flashes of light. Choreography and Music: Hofesh Shechter. Musical Collaboration: Nell Catchpole, Yaron Engler. Arrangements Percussion: Hofesh Shechter, Yaron Engler. Political Mother was commissioned by Brighton Dome and Festival, Sadler’s Wells and the Movimentos Festival of the Autostadt in Wolfsburg, as well as by the Biennale de la Danse de Lyon, Théâtre de la Ville, Romaeuropa and Mercat de les Flors. In cooperation with the Theatre Royal Plymouth und supported by DanceXchange Birmingham.